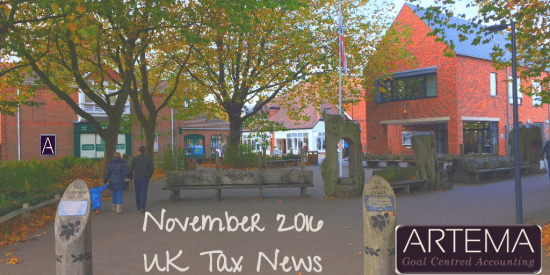 Welcome to our November 2016 UK Tax Newsletter. to save their company from being struck-off. This procedure is set out in Companies Act 2006, s 1000. That requires the Companies Registrar to send at least two formal letters to the company, and if no reply is received to either letter, publish a notice in the Gazette to inform the world that the company will be struck off three months after the date of that notice. It used to take around six months to complete the legal steps in CA 2006, s 1000, but now it can take only four months. This is because the periods between sending the formal warning letters have been reduced from a month to 14 days, and the notice period in the Gazette has been reduced from three months to two. These changes were made by the Small Business, Enterprise and Employment Act 2015, s 103 with effect from 10 October 2015. Companies House appears to have changed its internal practices to start the process of removing a company from the register much sooner than was otherwise the case Accountants have been told that if Companies House doesn’t receive a response from a company to three reminders sent over a two month period, it will commence proceedings to strike-off the company. A Ltd has a year end of 31 March 2015 so it should have filed its accounts by 31 December 2015. Companies House sent three reminders to A Ltd in January and February 2016 but received no reply. The Gazette notice to strike-off A Ltd was issued on 2 March 2016, with a commencement date for the notice as: 8 March 2016. It has been common practice for HMRC to object to the Gazette notice and prevent the company from being struck-off if tax was due, or was likely to be due. exist (HMRC Insolvency Manual INS5104). HMRC’s objections to a striking-off can be frustrating for a director who is genuinely trying to close down a failed company. But the HMRC procedure is needed to prevent the unscrupulous from trading through a UK company then allowing that company be struck off by ignoring Company House letters. The new rules are a simplification measure so that certain benefits in kind will not need to be reported to HMRC, as well as being tax free for the employee. There are of course a number of conditions that need to be satisfied to qualify for the exemption. Prior to this change in the rules, the benefit in kind would have had to be reported on the employee’s P11D form at the end of the year, or alternatively the employer would have dealt with the tax and national insurance under a PAYE settlement agreement. Under such an arrangement a £50 Christmas turkey to a higher rate taxpayer could end up costing the employer nearly £95! Please feel free to drop by at Artema HQ if you are considering taking advantage of this new exemption. November 2016 UK Tax News LondonWhere a married couple hold savings accounts and other investments in joint names, the income from those investments is split 50:50 for tax purposes, unless there is an election to allocate the income in accordance with their beneficial interests. This is particularly important where the couples’ marginal tax rates are different now that there are different personal savings allowances. Have You Declared All Credit Card Sales? Where credit card sales have been omitted from business takings, HMRC are encouraging taxpayers to come forward and make a disclosure of the income that has been omitted to avoid incurring interest and penalties on top of the unpaid tax. As you may be aware HMRC now receive information from third parties such as banks and credit card companies and will then match that data with business accounts, and will then open detailed enquiries if the figures appear to be inconsistent. They can go back up to 20 years and the more serious cases can lead to criminal prosecution. If you have other undeclared income or gains that don’t relate to credit card sales, there are other HMRC disclosure facilities to enable you to bring your tax affairs up to date. Have You Declared Overseas Income & Gains? Where an individual is resident in the UK, he or she is generally taxable on worldwide income and gains whether or not it is brought back into the UK. Again, there can be significant interest and penalties on top of the unpaid tax if HMRC find out. Note that there are special rules for individuals who are resident but not domiciled in the UK and those people’s tax status is likely to change from April 2017. Pop in to Artema’s Offices if you need further advice on this matter. The government is concerned that many small companies are missing out on generous R&D tax credits. For the last year HMRC have been offering companies an advance assurance scheme to check whether or not their activities qualify before they make a claim. So far over 200 applications for advance assurance have been made. If the R&D results in a product or process that can be patented there is a further tax break available. The “Patent Box”, introduced in 2013, will provide a 10% rate of tax on profits derived from that product or process. Call Artema if you would like to discuss whether these generous tax breaks could be available to your company. Ever since 6 April 2015 employment agencies and other intermediaries have been required to make quarterly reports of payments made directly to workers or via partnerships, LLPs and companies where no tax has been deducted from the payments. HMRC have recently updated their guidance to intermediaries to make it clear that, where an employment intermediary has supplied no workers in a specific quarter, a “nil report” must still be filed by the reporting period’s deadline.